There was a boy I knew who followed the interpretation of the verse in today’s portion, “It shall be your fringe and you shall look at it…” (Num. 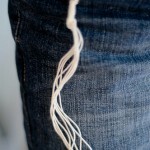 15:39), that tzitzit needed to be hanging out so one could look at them. Of course “out” is not the only adverb that goes with “hanging”. We all know about hang-ups and most of us have them. When we need to persevere we say we’re hanging in there. But this boy had quite a good idea nonetheless. He was implying that our Judaism ought not to be kept under wraps, as it were – a private relationship between our soul and our God. The world should see that we are Jewish, that’s what he was saying. These days the world does see that we are Jewish and not merely because of outward expressions like fringes on our garments and hats on our heads. It hears what we say, it sees what we do, it notices where we go. Sometimes there are Jews whose Jewishness hangs out when they involve themselves in somewhat questionable activities, more’s the shame. The best way to let our Judaism hang out is to exemplify Jewish ideas and insights, Jewish ideals and ethics, wherever we find ourselves. 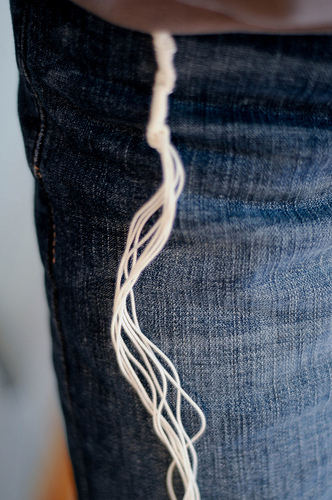 The world may not love us for our Jewishness, but our consciences will be clear. WordPress generated this page with 31 queries, in 0.243 seconds.